Solo idol and former member of Hello! Project Kikkawa You, a.k.a. Kikka, was chosen to be the official reporter for the very first Japan Expo USA held from August 23rd to 25th in Santa Clara, California. After JPHiP interviewed Kikka at Anime Weekend Atlanta andJapan Expo in Brussels last year, Tris-chan and Slack got another chance to catch up with the beautiful young songstress. We know that you’ve been very busy in the last year, so please tell us a little bit about how you’ve been doing since Atlanta. Early this year I was in the musical “Fiddler on the Roof”, and since then I’ve been keeping busy with promotion for my CD releases. Then this Summer I’ve been working with Kimaguren as “Kikkaren” and performing at various summer festivals. Several of your last singles have featured songs from Moritaka Chisato and Matsuura Aya, and last year you even released a whole cover album. Was there any particular song or artist you enjoyed covering? There’s a lot of them to choose from! I suppose I really liked ones like “Shoujo A” [Akina Nakamori, 1982] and “Sabishii Nettaigyo” [Wink, 1989]. If you could add another song to that album, what song would it be? Ehh?! That’s too hard since there’s so many songs to choose from! Maybe one from Goto Maki. I think I’d like to try singing one of her songs. Earlier this year, you played the role of Chava in “Fiddler on the Roof”. But in that musical and on TV dramas you’ve only been given supporting roles. Do you feel ready to take on a starring role, and if so, what kind of role would that be? I don’t really feel like I’m really ready for a starring role yet. But If I was given one, so far I’ve only been given normal, energetic, down-to-earth characters to play. So instead, how do I put it? I guess I’d like the challenge of being put in a more silent, kind of creepy role. Your collaboration with Kimaguren marks your first time officially working with male artists. What was it like working with them? Working with Kimaguren was a very refreshing and educational experience for me. I learned a lot of things like how to switch off and on for the camera, more about singing as an artist, and how to talk to the audience more effectively between songs. Speaking of Kimaguren, your collaboration with them is to promote Glico’s Cafe au Lait. How do you feel when you see your own commercials for Cafe au Lait? It makes me feel really happy, since I like to see myself on screen. Especially since they air the Cafe Au Lait commercials so often, friends often tell me they’ve seen me on TV. Overall, I think it’s great exposure for me. Does your family listen to or collect your work? What was their reaction when they heard your first single? My family tends to buy a lot of copies of my releases. They get ones for all our relatives, even friends of our relatives. But they haven’t really talked to me about their reactions, so I’m not sure what exactly they thought. Does your family buy your photobooks and goods as well? Yes, they’ve been buying my photobooks too! This time marks your third Japan Expo, but your first as “official reporter”. What is different this time and was there anything in particular you wanted to try as a reporter? Usually as a normal guest, I just wander around, so that part’s not that different this time as an official reporter. But it was a nice experience being able to ask questions to the other guests. There’s still one more day left, so I hope I can find a cosplayer with a great costume I could borrow and try wearing for a while! 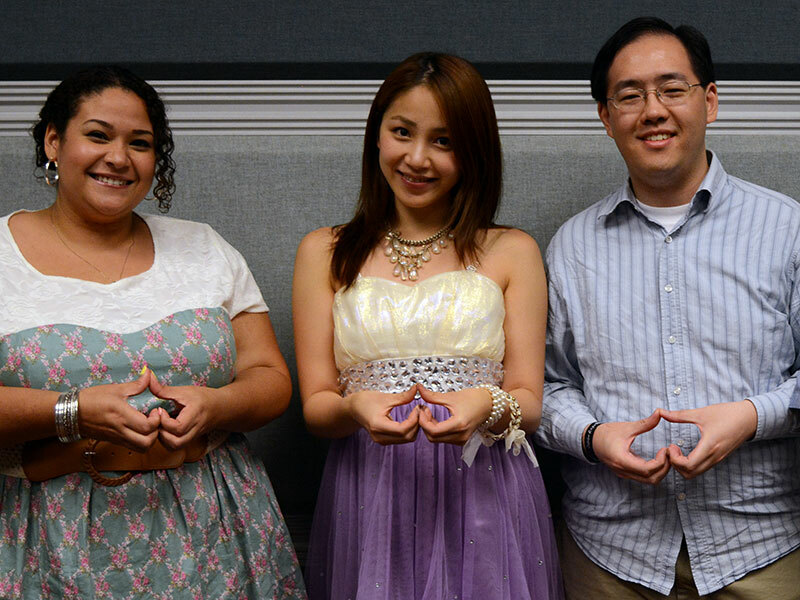 Special thanks to Sarah and Grace with Japan Expo USA and Philippe and Yaz for making this interview possible. We will have more interviews and articles from Japan Expo USA up soon! We will be having a small giveaway of Kikkawa You goods and autographed photos, courtesy of Kikka’s management! The rules will be announced in the coming days! Don’t miss it!